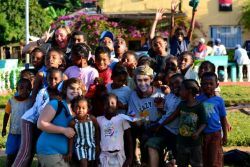 Caitlin, a student from the U.S. interning with OM Madagascar, shares what it’s like to leave home for the mission field. 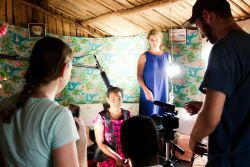 Caitlin, an intern with OM, participates in African and communications orientation in South Africa before flying to Madagascar. 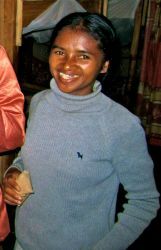 A Malagasy girl exemplifies dedication to spreading the gospel. 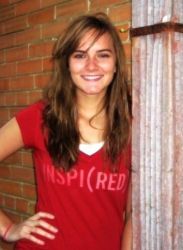 Caitlin (USA) is humbled that joining the OM team in Madagascar has encouraged them in their work to carry the name of Jesus to others. 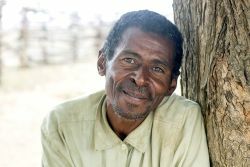 The king of a small village in Madagascar welcomes the OM team to plant a church amongst his people. 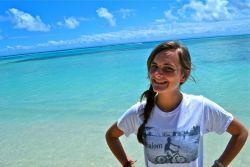 Caitlin, an intern, reflects on the lives touched by God during the OM outreach to Sainte Marie Island off the coast of Madagascar. A woman and her husband accept the Lord after hearing the gospel from an OM team visiting the island of Sante Marie. 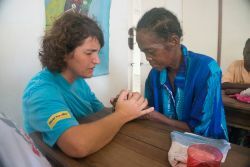 God touches many lives on Sainte Marie Island during OM Madagascar's annual outreach, "Listen to Me, Islands". 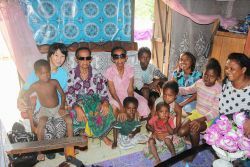 Affected by the dark reality of hopelessness she’s encountered in Madagascar, Caitlin Red prays that God will do miraculous things amongst the Malagasy people. 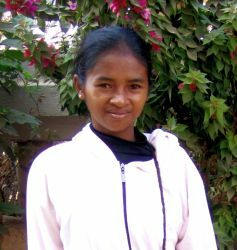 Hanta, a committed young Christian from a rural village in Madagascar, learns that if she’s willing to obey God, He provides a way. 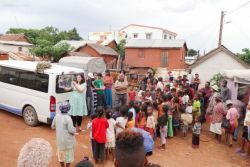 OM Madagascar’s annual outreach, “Listen to Me Islands,” includes outreaches to three destinations in the southern and eastern regions of the country. The first leg of these outreaches was from August 7-17 in a city called Bekily. The town opened its arms widely to the strangers in its midst. 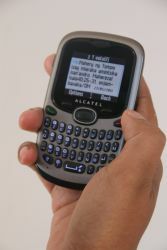 The OM Madagascar team mobilises the Malagasy church for prayer through radio programmes and SMS messages. 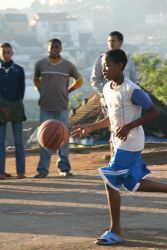 OM Madagascar uses sport as tool for reaching youth with the gospel and relationship building. 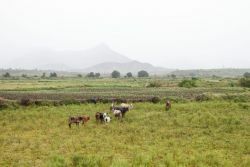 Starting a Christian micro-finance programme has been a long-time dream for OM Madagascar. In partnership with OM Hong Kong, this will soon become a reality. 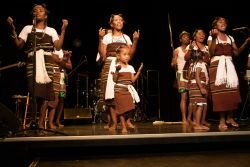 The vision of OM Madagascar is to partner with the Malagasy Church in every ministry. This vision is being realised in Manakara. 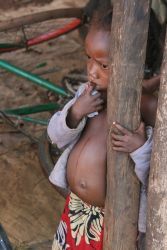 Project Namana is OM Madagascar's microfinance project designed to empower the marginalised people in the city. 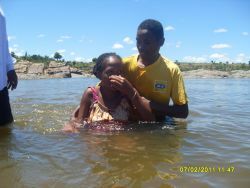 A Malagasy witch doctor comes to faith in Christ during an OM outreach and is baptised just one week before his death. Antemoro “coastal people” of Amosiala come to faith after learning about Christ through an OM team and volunteers from a neighbouring village. 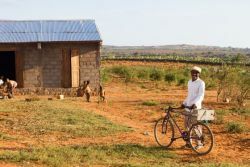 Since joining OM’s Namana Project, one couple has developed a successful business, built their own home and can give their children an education. Pastor Rene Armand, a pastor from the Androy region of Madagascar, shares how he became a pastor. 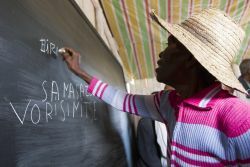 OM Madagascar responded to the declining literacy rate in the Androy region by starting a literacy course in Ambovombe. Last month the first class graduated, and the second class began. Perle, meaning 'pearl' in Malagasy, is a Freedom Climb project in Madagascar that teaches women skills to provide for themselves and their families. 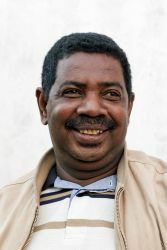 OM friend and volunteer Eddie Ramamonjiarivelo, from Madagascar, is a teacher and businessman with a heart for God’s kingdom. 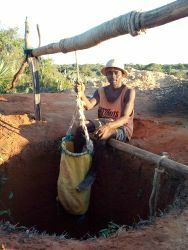 A well is built in the village of Tsimihevo, Madagascar, improving the standard of living for the whole community. 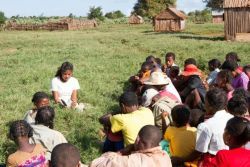 Perla, meaning “pearl” in Malagasy, raises awareness about human trafficking and provides skills training, coupled with discipleship, to at-risk women and girls. 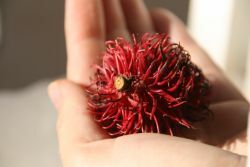 Rebecca discusses how a visit to a hospital in Madagascar changed her perspective. 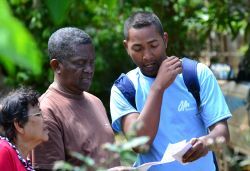 In a university Discovery Bible Study run by OM Madagascar, a student finds the answers he is looking for in the Bible. 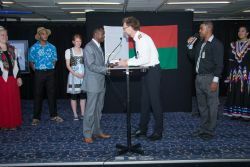 Toamasina, Madagascar :: Logos Hope arrives in Madagascar and holds official opening on Christmas Eve. 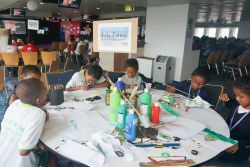 Toamasina, Madagascar :: Dan and Suzie Potter (USA), popularly known as the ‘Duzies’, conducts a workshop on board on connecting with people through creative ways. 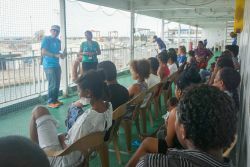 Toamasina, Madagascar :: Almost 200 local church workers in Madagascar came on board for a time to be encouraged and refreshed. 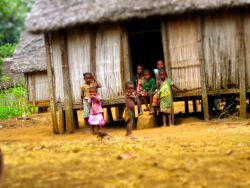 Toamasina, Madagascar :: Crewmembers go hut to hut in a rural village area to care and pray for villagers. Toamasina, Madagascar :: Logos Hope teams visit the world's largest civilian hospital ship and shared a word of encouragement with patients. Toamasina, Madagascar :: a Logos Hope team embraces leprosy survivors and shows them God's love and acceptance. 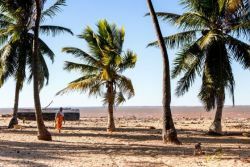 Toamasina, Madagascar :: Villagers from the south of Madagascar travelled three full days to Logos Hope to raise awareness of their situation and mobilise people to serve in their area. Toamasina, Madagascar :: Logos Hope crewmembers overcome their ‘giants’ during the one-week challenge team in Madagascar. 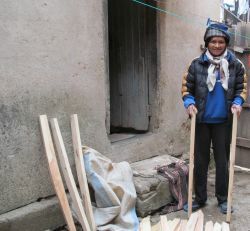 A village builds their own school - a big first for the area and a step in transforming the community. 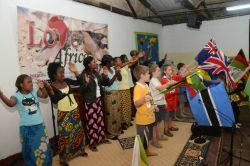 An outreach to the north of Madagascar was a new experience not only for those being reached, but for the participants and church as well. Despite knowing very little about the Androy region, OMers Fara and Herimanina went willingly and have seen God at work. 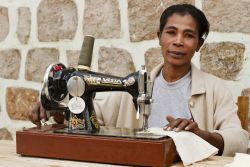 Perla is a Freedom Challenge project in Madagascar that is empowering women through skills training. 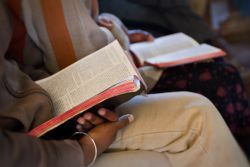 An OMers love for people from the Island of Comoros led her to start a Discovery Bible Study for them at a university. 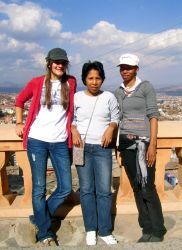 “Before Media Trek I thought: media--cool hobby, but not necessarily missional,” admitted Kotie-Alet from South Africa. "Why was being a foreigner a problem though? It isn’t wrong. It’s not a bad thing, nor anything to be ashamed of. It simply means ‘I’m not from around here.’ But in my mind to be called a local would have meant that I had made it – that I had fully adapted and that I ‘belonged.’ And while it is important and recommendable to assimilate into the local culture where you are, it is equally important to remember that the world is not our home," said OMer Rebecca.